Airbus is considering adding a small lower deck to the forthcoming A350-1000 jet to accommodate lavatories and kitchens. Shifting these 'service areas' off the main deck would free up significant amounts of space for more seats in both business class and economy class, Airbus says. "The average passenger doesn't want to sit next to a lav and doesn't want to sit next to a galley" explains Kiran Rao, Airbus Executive Vice-President for Strategy and Marketing. "So we are looking to utilise the under-floor area of the A350-1000 for galleys and lavs," Rao told Australian Business Traveller at the launch of the aircraft manufacturer's Airspace cabin concept in London. It's understood that some larger lavatories would remain on the main deck for reasons including accessibility by disabled travellers. Airbus is already experimenting with relocated loos on the new A330neo, in which economy lavatories shift from the main cabin into a single service area alongside the galley kitchens, such as at the rear of the A330neo. The A350-1000 is a larger and longer-range version of the A350-900, which most recently added Singapore Airlines to its growing list of customers. Qatar Airways is the launch customer for the A350-1000, which is expected to take wing in the middle of 2017. The A350-1000 will typically carry 366 passengers compared to 325 in the A350-900, although the actual passenger count depends on each airline's seat design and overall layout. However, freeing up space occupied by galleys and lavatories could boost the seat count closer to the 400 mark – a measure with substantial appeal to airlines. I didn't know SQ had the -1000 in order, when did that came out? 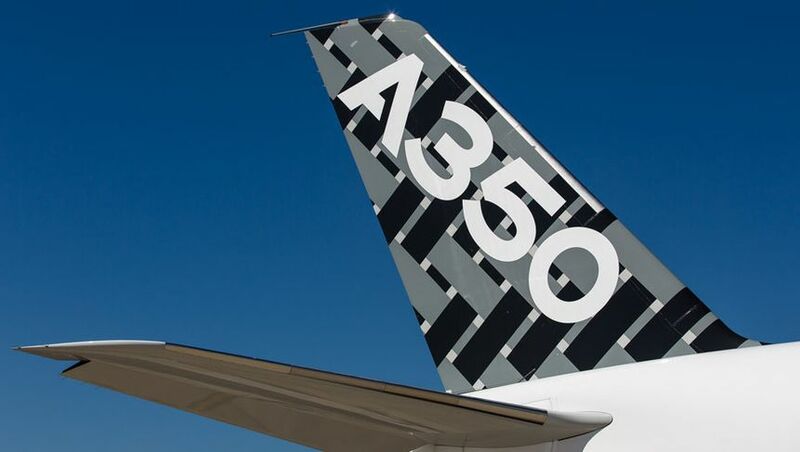 SQ hasn't ordered the A350-1000 – the line "The A350-1000 is a larger and longer-range version of the A350-900, which most recently added Singapore Airlines to its growing list of customers" refers to SQ's A350-900. Read to fast, my bad. Problem with such interpretation is that SQ 1st ordered 359 back in mid-2006. In other words, SQ has been a 359 customer for nearly 10yrs which doesn't gel well with being a "most recently added...". And the consequence of this will be reduced cargo space. But maybe that won't be a huge negative depending on the nature of routes that this airframe is targeted at. So it may be a fine choice. Did Mr. Rao happen to share with you drawings of this idea? I remember the A340-600 having lower lobe lavs and galleys with a stair to reach them. I would like to see where he proposes to place the stair on the A350-1000. No (if we had any images of the concept we'd certainly have published them). Lufthansa configures their A346s this way. Sure do, according to this link http://www.seatguru.com/airlines/Lufthansa/Lufthansa_Airbus_A340-600_D.php the stairs take up the space for 6 economy seats with 5 lavatories on the lower deck. Sounds exciting and more inovative than just reconfiguring seats to make space! Great option for carriers that arent cetered on cargo as theremain profit center (something I alwasy seem to hear about in regards to CX). This is not a 'new' or particularly innovative idea, just a new rendering. It is easy for people to forget that the early model B747-100's & 200's plus the DC10-10's had this feature for many years. On the first Qantas B747's, the main galley kitchen was located directly underneath the First Class cabin. There was both a full height elevator (for crew) and a half-height elevator (for transporting food carts) between levels. In case of power failure or interruption, there was also a ladder and 'escape' hatch (located under/through the First cabin) which allowed staff egress in the event of a problem. As also noted, the LH A340-600's also had some of the lavatories located downstairs from the main passenger level. Mind you, for frames / airlines that are not 'cargo-heavy' or for ULH flights, this separation is a welcome return idea IMO. It would be great move! Leave just 2 lavs (one in front and one in rear) for disables and baby changing and shift the rest underneath and make them bigger. Really win-win scenario! Who would actually be winning by this scenario, certainly not the fare paying passenger. Sounds like an inconvenience on the way to the conveniences to me. In my books it all positive – no door slamming, no smell, no queue in aisle. Also there is a chance that they did lavs bigger and more of them. Yes, centralise the facilities downstairs for economy, it will be like half time at a Grand Final trying to get a pit stop. Umm, has anyone bothered to think how passegers will access those facilities down stairs, or how the food will be brought up, you will need stairs, or dumb waiters or passenger lifts etc, can't see the entire exercise creating that much more seating if all that space is still required for access points/shafts that will be essential. Can't imagine Business or First travellers wanting to go below for a facility visit. Sounds like something a cheapie airline would do in the hope of squeezing in an extra seat. "Oh drat, we totally didn't bother to think how passengers will get to the toilets, or how crew will bring food up!" - said nobody at Airbus, obviously. Imagine the poor flight attendant on scullery duty down in the 'dungeon' slaving over that hot stove. They might be expected to give the lavs a quick hose out whilst down there as well. No thanks. I'll facilitate upstairs in Business with my spacious burl walnut facility with panoramic view and fresh flowers and squirt of Bulgari fragrance to finish up with. Ah - that's much better. ... which is absolutely no different to the current F/A duties of those working on single-level aircraft today. 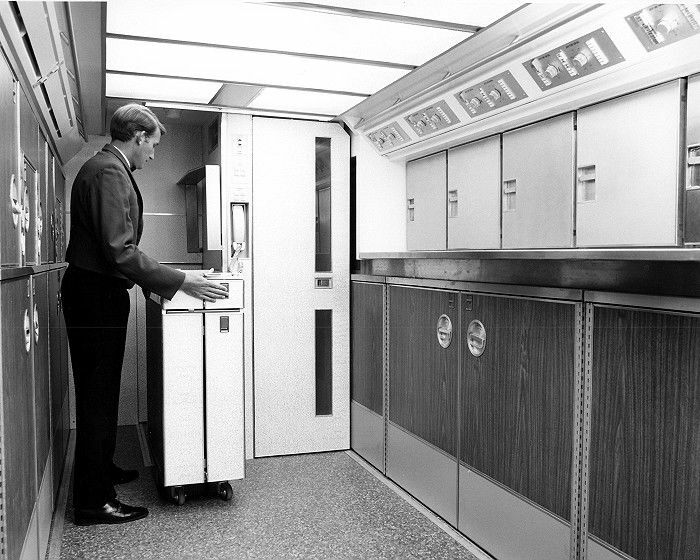 Here's a pic of the lower lobe galley on QF VH-EBA from the early 1970's showing the two half and full-height elevators. This one was located at the entrance L2 door and extended forward under the J Class cabin. The (forward) escape is not shown since this is where the pic was taken from. If I remember correctly, QF had different slightly different configurations for the standard -238's, the SP's and the combi's. I recall seeing a great pic (think it was on airliners.net) of a crew member exiting into the F Class cabin from the ladder. I'll try and find it and will post, if possible. Agreed on it being a coveted position, from friends who worked them. Also not widely known was that QF initially only allowed male F/A's to work the LLG (lower lobe galley) but this subsequently changed when female F/A's were denied promotion. Apart from AA & UA, only QF, KL and a few others offered the B747 LLG and most were removed in the late 70's. Comment on "Airbus considers split-level layout for A350-1000"